2015 Bargaining with UBC for a new collective agreement. July 30, 2015: Collective Agreement covering 2014-2019 is ratified at a membership meeting. Major negotiations for Component I concerned UTA wages, Lead TA positions, Tuition Protection, Orientations and notice of allocation of hours. This also included a 5.5% wage increase over 5 years, reflecting the provincial government mandate at the time. Spring- Executive polls membership to ID potential bargaining items for the coming round. Fall- Department Representative training takes place as part of a broader outreach initiative to engage members across campus with Local business. For the first time in our collective memory, nearly every department has a union representative. Meanwhile, Local Bylaws are being reevaluated for the first time since 1994. 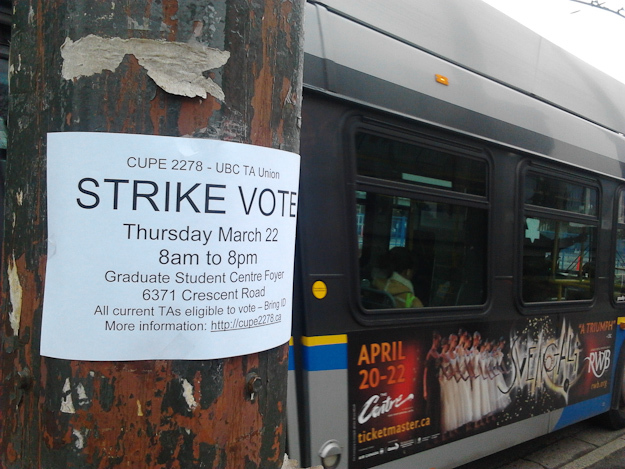 March 22 – UBC’s Teaching Assistants and English Language Instructors took a strike vote after two years of bargaining. There were approximately 2,300 members eligible to vote. Of those, 810 voted; 655 voted yes; 150 voted no. There were 5 spoiled ballots. The percentage of voters who turned out is definitely comparable to the 2003 vote of CUPE 2278. We are searching for the exact numbers from 2003, but we are confident they are similar to our turnout . Given the total lack of official access to the e-mail addresses of our members to promote a very fast campaign, the executive considers the numbers strong. In comparison to other democratic votes, particularly votes on the UBC campus, these vote numbers also compare favourably. 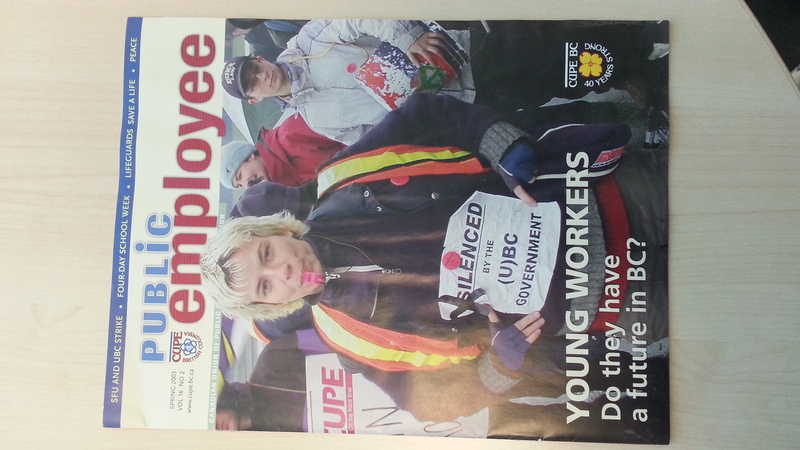 April 12, 2012 – We agreed to enter Mediation at the BC Labour Board. 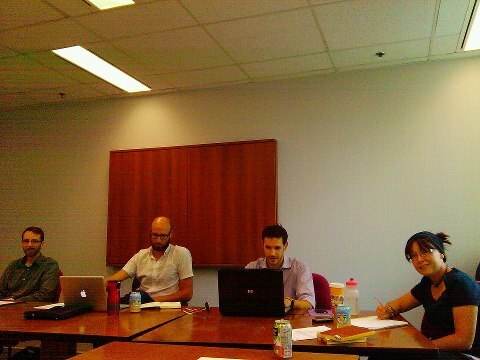 May 10, 2012 – CUPE 2278 and UBC met in mediation at the Labour Board. Nothing substantial happened. August 23rd and 24th, 2012 – We met with the employer at the Labour Board and received our first monetary offer. It was below the provincial mandate of 0,0,2,2% increases over 2010-2012. October 10 and 12, 2012 – We attended more mediation dates with no substantial results. 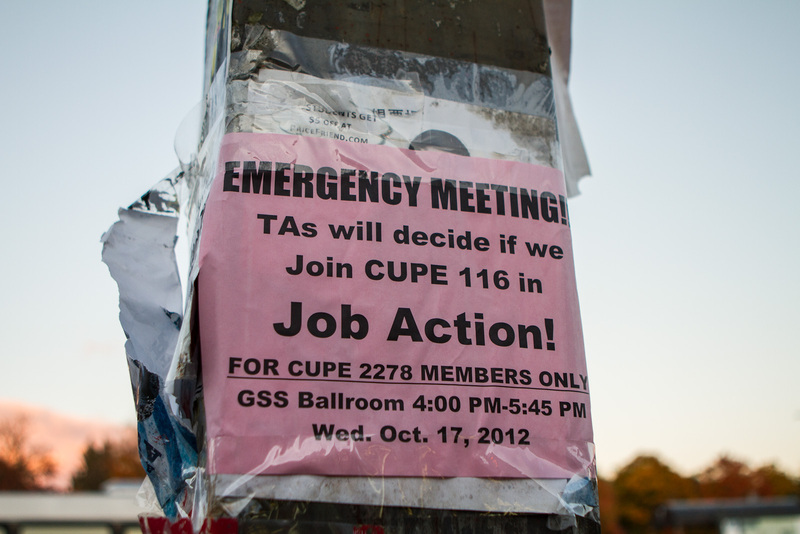 October 25, 2012 – Members voted to enact strike mandate achieved in the spring term. We held a second vote to ensure new members of the local would have a voice in the decision to withdraw our labour. 76% of members remained willing to withdraw their labour. October 26, 2012 – at 3pm, a 72 hour strike notice was served. October 30-Nov 6 2012 – Local 2278 was on strike. We used a rotating picket and chose select buildings for picket lines communicating times and locations via email and social media the night before. 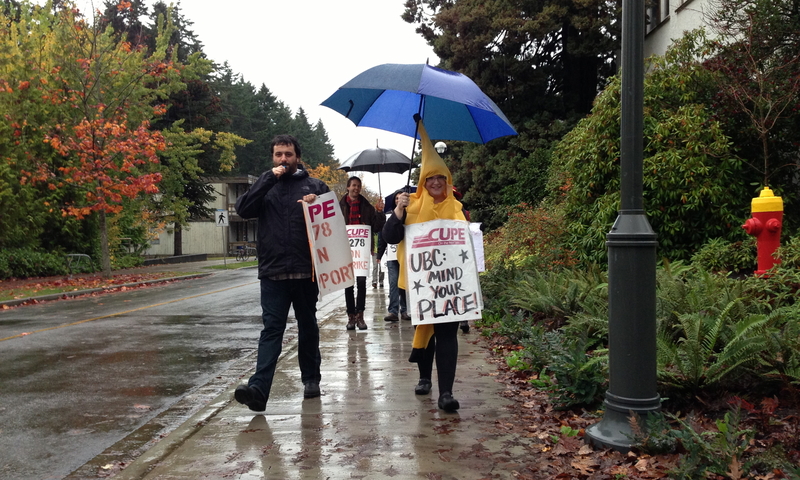 The Halloween Picket saw TAs in costumes handing out candy to undergrads while picketing Geography and Math. In the late hours of Nov. 6, 2012 – a tentative agreement was reached with UBC with assistance of mediator Vince Ready at the Sheraton Vancouver Airport Hotel in Richmond, BC. An one-time Hardship Fund was established to assist with hardships related to the cost of employment (aka tuition), wage increases were set at 0,0,1.5,2,2% with a two month period of smaller wage increases funding the “40K” Tuition Hardship Fund. Substantial improvements in languauge were also achieved including protection from “academic harm”- the first such language bargained in North America to our knowledge. 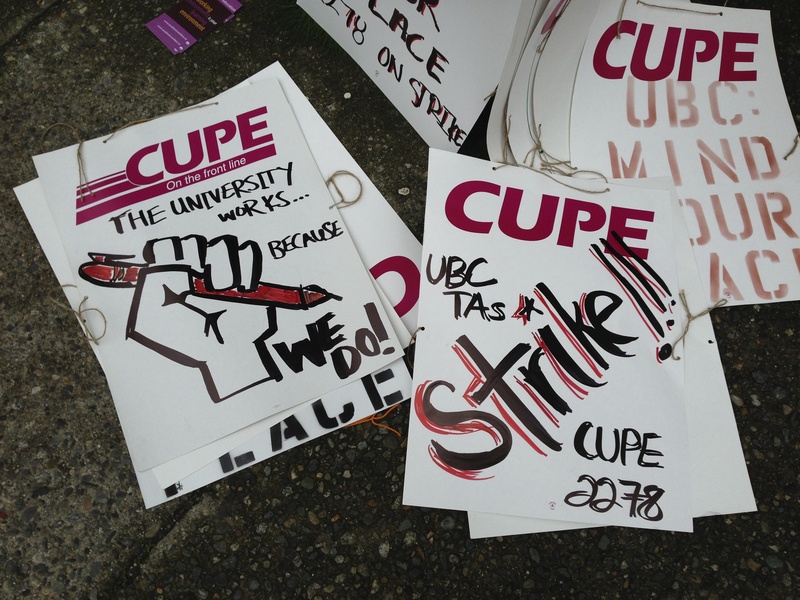 January – Issued strike notice while on Christmas break, followed by 3.5 weeks of rotating surprise pickets around campus (using non-traditional picketing). Many people were supportive: our sister unions (CUPE 116 and 2950), the labour movement, many of the faculty, even the general public. February 25 – UBC admin took all TA’s off payroll, even those still working. March – UBC admin got an injunction to make us stop singing and drumming, which raised concerns about free speech and the role of the university as place for debate. March – TA’s defied the legislation and the strike became a political protest. Eventually, UBC admin came back to the table. We acheived 11.5% wage increase over 3 years and saved our medical benefits at a time of public sector wage freezes. March 12 – B.C. legislature passed Bill 21: The University of British Columbia Continuation Act in one day, which declared the grading of term papers an ‘essential service’. This made the strike illegal and forced TA’s back to work. August 31 – The Collective Bargaining Agreement of the time was ending. Our Executive was bargaining for wage increase, parental leave, and tuition indexing. Other campus workers had tuition waivers and we wanted them too. October – Bargaining was getting more and more difficult. All the ‘non-cost’ issues had been discussed, but money was still on the table. People were getting worried. November – Large membership meetings, in which the possibility of a strike vote was discussed. At one meeting, 400 TA’s filled the GSS ballroom. Many were angry that TA’s in Toronto and SFU were doing the same work as us but receiving higher wages, and with better work conditions. December – A strike vote was held, with 86% of membership voting to go on strike. 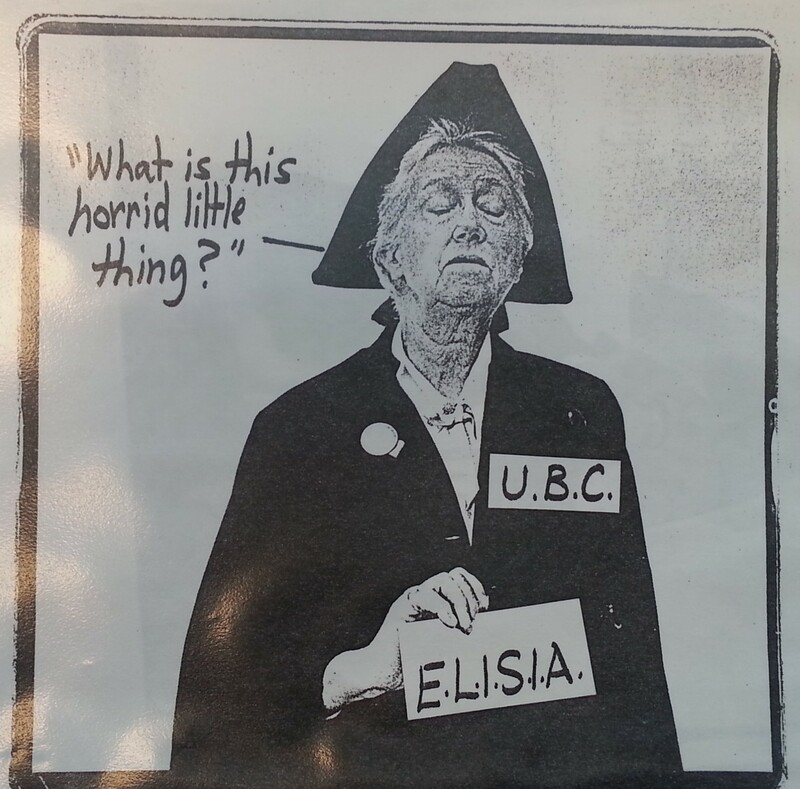 After a lengthy fight, ELISIA is allowed to unionize, but must join CUPE 2278 after a labour board ruling that UBC had a proliferation of unions. The English Languauge Instructors become Component 2 of CUPE local 2278. 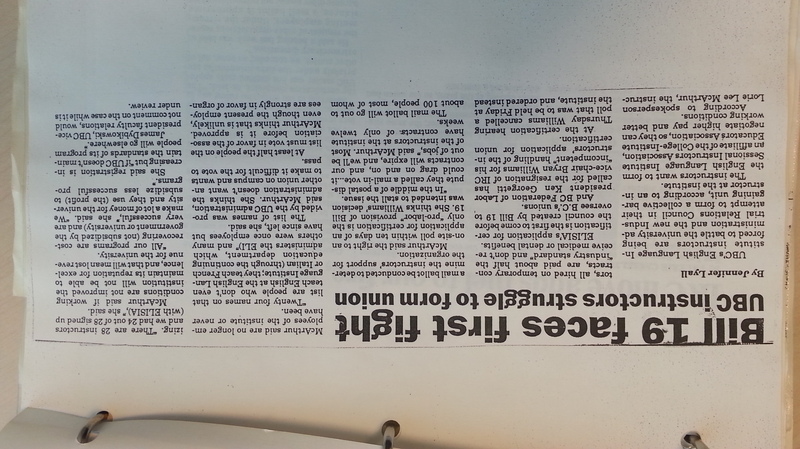 Article about the union certification under Bill 19. 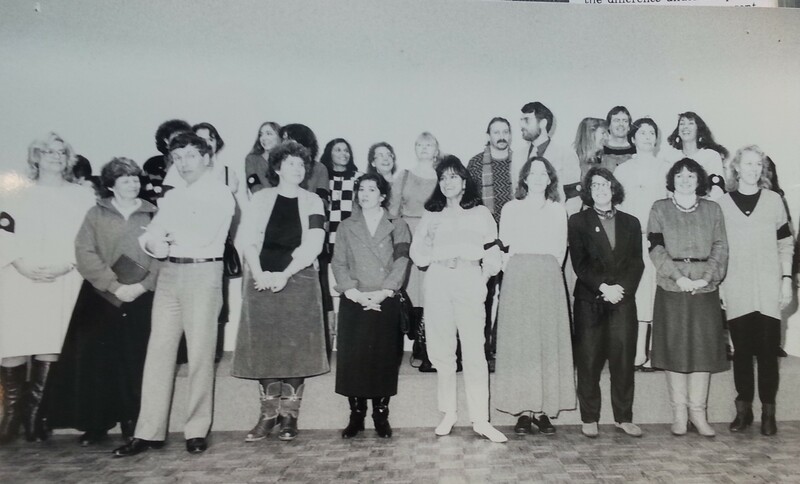 January 20 – Negotiations conclude and the second (1981-1982) collective agreement is signed. December 15 – Negotiation with the university for the next collective agreement comes to a head. University proposes a two year agreement initially, but changes its mind and forces a one year agreement on the union. The university had initially proposed a two stage wage increase (6.35% in the first year and 5.1% in the second). The union served a 72 hour strike notice in response. December 22 – Negotiations resolved with the union negotiating team recommending to its members a one year agreement with 6.35% wage increase. March – First collective agreement is signed for the term of one year (1 Sept. 1980 – 31 Aug. 1981). Big accomplishments included a 14% wage increase, standardized pay rates, a grievance procedure, overtime pay. The agreement did not include the union security clause that the union wanted. Sept 8 – Negotiations begin for the next contract. Issues include the aforementioned union security clause, wages, and rebates. 1980 We’re Legal! CUPE 2278 is recognized by the Labour Board. March – The union, CUPE 2278, is officially certified and is now a legal union which the employer is required to recognize and negotiate with. May through September – First contract negotiations end unresolved. October through December 8 – Negotiations occur with the aid of a mediator. December 8 – University walks out of negotiations on the issue of Union Security (automatic enrollment in the union as a condition of employment – an important issue for 2278 because of the high turnover rate among its membership). Jan – Association of Teaching Assistants (ATA) begins meeting with union representatives (AUCE and CUPE) to learn more about what unionizing can do for the TAs of UBC. Feb 23 – ATA exec officially recommends membership with CUPE so that the organized TAs will be taken more seriously by administration. 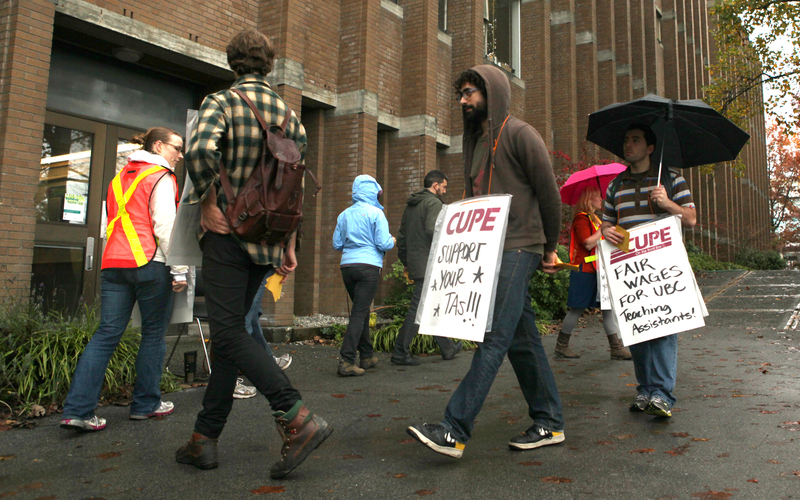 A vote is taken at a membership meeting as to whether UBC TAs should unionize under CUPE. There were 30 in favour, 7 opposed, and 5 abstentions. March – The ATA gets a charter to become CUPE 2278 and begins the organization drive [great leaflet in newsletter section of ATA binder]. If 45% of TAs join, the Labour Relations Board puts a vote to the membership, and assuming a majority in favour, the union becomes a local. If 55% of the membership joins, it is automatic. Fall – Over half of the bargaining unit joined, and 70% voted in favour of unionizing. December 11 – Strike vote is introduced in membership meeting over issue of Union Security (“shop clause”).